The tenth, jubilee season of the transmissions and retransmissions "Bolshoi Ballet Live" from the Moscow scene will begin on October 27, 2019 with the HD LIVE performance of Raymonda – a great classical ballet to the music of Alexander Glazunov, rarely performed on western stages due to the extremely high demands placed on dancers. Traditionally, among the seven presented titles, there will be stagings of great nineteenth-century classical ballets, awaited by ballet lovers all over the world. We will see Piotr Czajkowski's Swan Lake in the new cast of soloists and The Nutcracker around Christmas. Both ballets were choreographed by Yuri Grigorovich, a long-time director of the Bolshoi Theater ballet company. After a huge turnout success and repeated retransmissions, a beautiful romantic ballet Giselle will re-appear on the screens, but in a completely new choreography by Alexei Ratmański. We will also watch a colorful, oriental Le Corsaire – an adventurous story about the pirate Conrad and his beloved Medora abducted to the harem of a sultan. Following the previous seasons, the programme will also feature 20th-century masterpieces. At the end of the season, the new version of Romeo and Juliet, prepared for the Bolshoi Theater by Alexei Ratmański and broadcast live in 2017, will be screened again. In April, the Jewels – a ballet evening in three parts in George Balanchine's choreography – will shine on the screens. This beautiful spectacle honors three styles of dance, compared to precious stones: emeralds, rubies and diamonds. For over two centuries, the Bolshoi Theater ballet company (the State Academic Grand Theater of Russia) has made a name for itself not only among the dance lovers. 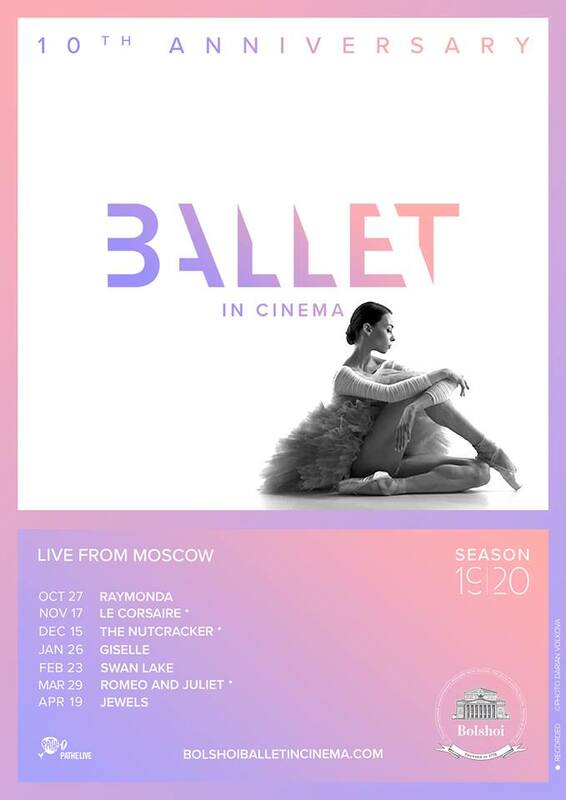 The Bolshoi Theater rarely performs outside its headquarters, which is why the annual cycle of transmissions and retransmissions of the most beautiful ballet performances from Moscow has become a real treat for the audiences around the world. On March 24 – April 14, 2019, the Municipal Theater in Gliwice invites you to the jubilee 10th edition of the "Spring with Fryderyk" Festival. This year's edition of the festival includes four concerts: "Polonez means Polish", "Aristocrats of the world of sounds", "Miniatures and their great cycles", "Dreams and confessions of love". 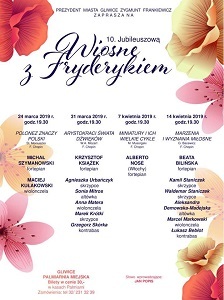 The works of Fryderyk Chopin, Stanisław Moniuszko, Grażyna Bacewicz, Modest Mussorgsky and Wolfgang Amadeus Mozart will be presented by the pianists Michał Szymanowski, Krzysztof Książek, Alberto Nose, Beata Bilińska, cellist Maciej Kułakowski and two string quintets. The concerts will take place in a tropical setting – in the Palm House in Gliwice, on Sundays from March 24 to April 14 at 7.30 p.m. 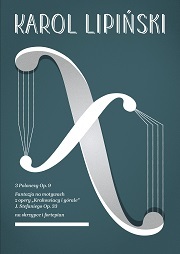 The Lublin Branch of the Association of Polish Musicians invites you on March 30, 2019 at 6:00 p.m. to the Crown Tribunal for the second event as part of the series of chamber concerts "Fonie Lublina". 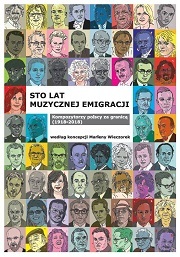 The 2019 edition includes 10 concerts, each of which will show S. Moniuszko's music in a different, not only Polish, context. The programme of the concert is a clash of two seemingly distant generations. After the wave of enthusiastic reviews after the premieres of Halka, The Haunted Manor and other works of the composer, the first years of the 20th century did not treat Moniuszko's legacy well. 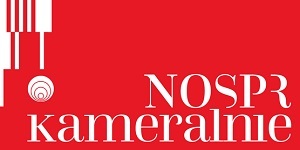 However, some composers of the turn of the 19th and 20th centuries did continue the work begun by the "father of the Polish national opera", especially in terms of vocal repertoire. 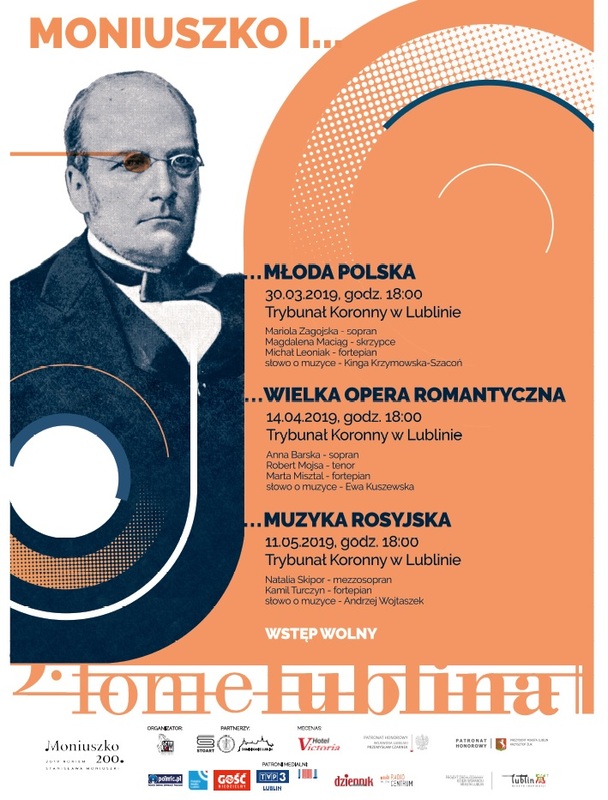 It is impossible to treat Karłowicz's or Różycki's songs as a novum since they are strongly embedded in the romantic style cultivated by Moniuszko, with their beautiful melodic lines, lyrical and dramatic elements. The programme of the concert will include small vocal forms by Stanisław Moniuszko as well as instrumental miniatures – violin and piano – by a slightly younger, almost forgotten composer, Michał Jelski, including his Valse de concert, Op. 25. 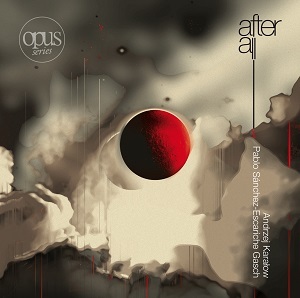 The works will be presented by: Mariola Zagojska (soprano), Magdalena Maciąg (violin) and Michał Leoniak (piano). Four years ago, Australian Daniel Smith, the winner of the 9th Grzegorz Fitelberg International Conducting Competition (2012) and currently the main guest conductor of the Carlo Felice Theater in Italy, performed on the stage of the Silesian Philharmonic. 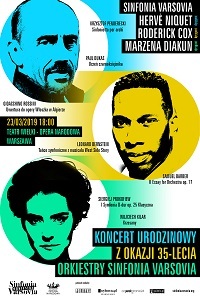 A concert on March 22, 2019 at 7.00 p.m. will be a rare occasion to see him perform again in Katowice. Over the last four years, Daniel Smith conducted the Norwegian National Opera in Oslo, participated in the new production of The Journey to Rheims directed by Michieletti with the Australian Opera in the Sydney Opera House, took part in the concert tour with violinist Ray Chen, performed at the Tuscan Philharmonic and with the Royal Seville Symphony Orchestra. In the concert programme of the Silesian Philharmonic Symphony Orchestra under his baton, there will be Polish, Austrian and German music. We will listen to the Little suite by Witold Lutosławski, Symphony in G Minor No. 40 KV 550 by Wolfgang Amadeus Mozart, and Symphony No. 4 in E Minor, Op. 98 by Johannes Brahms. "Vive la Gioacchino Rossini!" 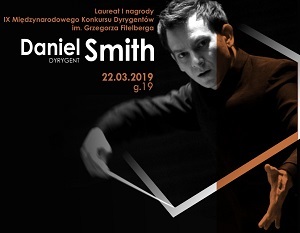 – under this slogan two spring concerts of the Elbląg Chamber Orchestra will take place on March 24 and April 28, 2019 in the Concert Hall of the Elbląg City Hall. Although Gioacchino Rossini is known primarily as the author of operas, his sonatas are no less worthy of interest. Elbląg Chamber Orchestra along with conductor and violinist Jan Stanienda will perform two special concerts of Rossini's sonatas for the Elbląg music lovers. 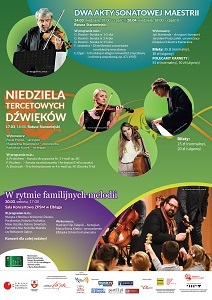 The programme of the eveniengs will be complemented by chamber music of Mieczysław Karłowicz, Feliks Janiewicz, Edward Elgar, and Andrzej Panufnik. 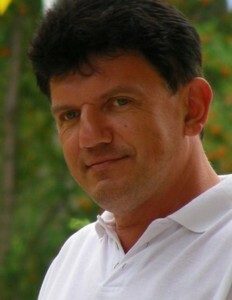 The concerts will be hosted by Jarosław Praszczałek. The concert is held under patronage of the PWM Editions as part of the TUTTI.pl project promoting the performances of Polish music. It was 35 years ago that one of the most famous violinists of the 20th century – Yehudi Menuhin – visited Poland for the first time. His visit inspired the formation of the Sinfonia Varsovia Orchestra, currently considered to be one of the best orchestras in Poland. To celebrate its anniversary, please join Sinfonia Varsovia in Teatr Wielki – the National Opera in a festive birthday concert on 23 March 2019. The repertoire of the concert on the occasion of the ensemble’s 35th anniversary of its formation relates to the most important persons and events in Sinfonia Varsovia’s history. The concert opens with Sinfonietta per archi, composed by Krzysztof Penderecki, Sinfonia Varsovia’s artistic director. The work bears a special dedication to the Orchestra. Its inclusion in the evening’s programme is a reference to the Polish Chamber Orchestra, which was the cornerstone to Sinfonia Varsovia’s formation. Next in the programme is the overture to Gioacchino Rossini’s L’Italiana in Algeri – a work the ensemble performed many times under Menuhin’s direction. 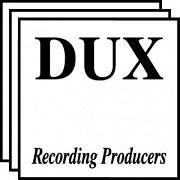 Directing this work will be French harpsichordist and conductor Hervé Niquet, who will also conduct the work to follow – Paul Dukas’ The Sorcerer’s Apprentice. French music and cooperation with French artists occupies a significant position in the Orchestra’s repertoire.  Sinfonia Varsovia has been a continuous presence at major music festivals in France, including La Folle Journée and the La Roque d'Anthéron Piano Festival for more than 20 years. 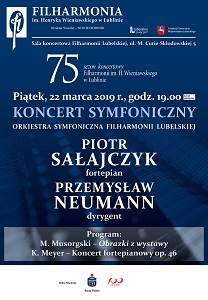 A symphony concert on the occasion of the 110th death anniversary of Zygmunt Noskowski and the 150th birth anniversary of Albert Roussel will take place on March 22, 2019 at 7:30 p.m. at the Kraków Philharmonic. The concert will begin with The Steppe by Zygmunt Noskowski – the first Polish symphonic poem, expressively depicting events at the Ukrainian steppes in the 17th century described in Henryk Sienkiewicz's Trilogy. The work will be performed by the Krakow Philharmonic Orchestra under the baton of Charles Olivieri-Munroe, the artistic director and main conductor of the Cracow Philharmonic from the 2015/2016 season. Next, we will listen to the brilliant Piano Concerto in G major by Maurice Ravel with the solo part performed by Charles Richard-Hamelin – one of the most promising contemporary Canadian pianists, winner of the second prize and Krystian Zimerman award for the best sonata performance at the 17th International Fryderyk Chopin Piano Competition in Warsaw in 2015. The evening will end with Albert Roussel's impressionist Symphony No. 3. 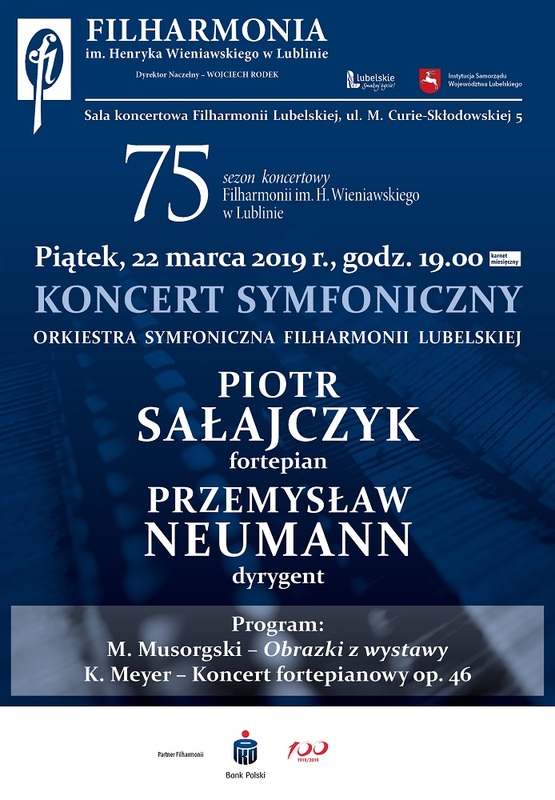 An outstanding pianist, soloist and chamber musician Piotr Sałajczyk will perform together with the Lublin Philharmonic Symphony Orchestra under the direction of Przemysław Neumann on March 22, 2019 at 7.00 p.m. in the Lublin Philharmonic. The programme of the concert will include Modest Mussorgsky's piano miniatures from the series Pictures at an Exhibition in the orchestration by Maurice Ravel and Piano Concerto, Op. 46 by Krzysztof Meyer. The latter was a student of Nadia Boulanger, Krzysztof Penderecki, and Witold Lutosławski. As one of the representatives of the 20th century Polish musical avant-garde, he made his debut at the Warsaw Autumn Festival at the age of 22 – as the youngest composer in the history of the festival. 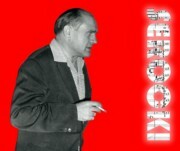 Many of his works have classical titles, suggesting the use of a traditional forms, but their internal structure and sound language are a manifestation of a fully conscious, individual use of a modern compositional techniques. In Grażyna Bacewicz's catalog of works, there are two piano quintets: from 1952 and 1965. The first one belongs to the neoclassical period, in which the composer referred to traditional forms, folk stylizations, expressive themes, transparent texture, and clear narrative. Less known is the Second Piano Quintet, commissioned by Władysław Szpilman for the Warsaw Quintet. Its texture and form is more complex, harmonic language is more radicalised, and it pertains to the sonoristic style.Piano Quintet in F minorby Johannes Brahms was created on the basis ofSonata for two pianos (op. 34b). Brahms wrote it for Klara Schumann as a future performer. It is one of the most popular piano quintets in the history of this genre. Tarnowskie Góry | Concert cycle "Two streams"
Łącko | Start your summer with classical music!